I’ve written before about the curious fact that there are a number of linguistic terms for things I recognize but never knew had a name. Mondegreen is one of those terms. 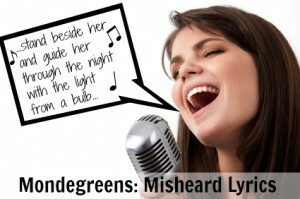 A mondegreen is the mishearing or misrepresentation of a phrase, usually from a song or poem. In a recent post, I pointed out that “a blessing in the skies,” “for all intensive purposes,” and “it’s a doggy-dog world” are all examples of mondegreens. The point about what I shall hereafter call mondegreens, since no one else has thought up a word for them, is that they are better than the original. Christmas songs are particularly susceptible to mondegreen. Can you correctly translate the following mondegreens from Christmas carols? How about you? Do you have any funny mondegreens you’ve heard or created? Kids are particularly good at mishearing lyrics and repeating them with confidence! Share yours in the comments below. I thought by now you’d realize………. It took me about 20 years to get it right! Those would be dangerous for sure! My granddaughter Tillee thought Bob the Builder was Bob Matilda. Had to show it to her in writing before she would believe us. From the country song, “Lucille,” by Kenny Rogers. Lol. I don’t think you’re the only one, either! And I don’t want to meet your wife. Let’s just say I have some family members with hearing problems! These are all so funny. Thanks! These made me laugh, too, thanks, Linda!